Gwent is a Witcher 3: Wild Hunt minigame that, unlike Geralt's other tavern-based pastimes (drinking and fighting), proved to be wildly popular in its own right: A couple of CD Projekt developers posted a tutorial video on YouTube to help new players grasp the basics of the card game, and a Gwent mod for Tabletop Simulator was released shortly thereafter. CD Projekt even created a sweet physical edition of a Gwent deck for the Hearts of Stone retail release. 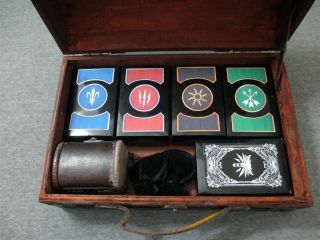 But it all pales in comparison to this "Ultimate Gwent Set", which was created by Imgur user Waffleguru. It is, in my ever-so-humble opinion, nothing short of spectacular: Five laminated decks (with duplicate cards, for effective deck-building), a cotton-canvas playing surface, full rules printed on "magazine cover paper," cheat-sheet cards, counter tokens, and gems (in their own little pouches), all contained in a gorgeous wooden chest (at least, it looks like wood) with a leather carrying strap. "Glorious" isn't a strong enough word to describe this thing, which she made for her Gwent-hooked boyfriend, and yet amazingly it's not the only magnificent videogame treasure she created for the holidays: He's also getting this fantastic, loot-loaded Fallout 4 ammo box. Needless to say, my envy is off the scale.